Suitable for assessment of oxidative stress using urine samples. For research use only. 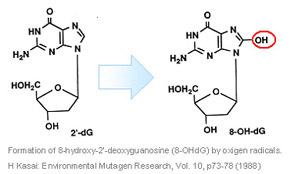 8-hydroxy-2'-deoxyguanosine (8-OHdG) is a product of oxidatively damaged DNA formed by hydroxy radical, singlet oxygen and direct photodynamic action. 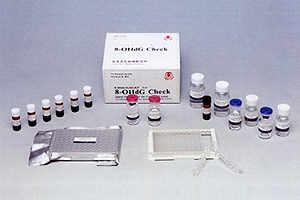 8-OHdG can be detected in tissue, serum, urine and other biomaterials. New 8-OHdG Check is a competitive enzyme-linked immunosorbent assay (ELISA) utilising monoclonal antibody (clone N45.1) which is highly specific for DNA damage, not cross react with RNA oxidation products such as 8-hydroxy-guanine and 8-hydroxy-guanosine. This product is suitable for detection of 8-OHdG in urine and other biomaterials from human and animals. This product is a 8-OHdG ELISA kit utilizing anti 8-OHdG monoclonal antibody (clone N45.1) which is highly specific for 8-OHdG. We provide two types of 8-OHdG ELISA kits with different assay range. New 8-OHdG Check ELISA is suitable for urine and serum sample from animal and human. If you are planning to measure 8-OHdG in human serum,tissue, cultured cells, we recommend to use 'Highly Sensitive 8-OHdG Check ELISA'. Specifity: Specific for 8-OHdG. Antibody have been tested to 8-OHdG analogues (guanosine(G),7-methyl-G, 6-SH-G, 8-Bromo-G, dA, dC, dT, dI, dU, dG, O6-methyl-dG,8-OHdA, guanine(Gua),O6-methyl-Gua, 8-OH-Gua, uric acid, urea, creatine, creatinine, 8-sulfhydryl-G, 8-OH-G). Applications: Urine from human and animals. For serum and tissue samples, Highly Sensitive 8-OHdG Check (code #KOG-HS10E) is recommended. Storage: Store at 4 - 10°C (don't freeze). Expiry: 12 months after the day of manufacturing. Required but not provided: Micropipet and chip (100 micro L, 1000 micro L). Measuring pipet (10 mL, 20 mL)/ measuring cylinders. 8 or 12-syncronous multichannel pipet and reagent tray for multichannel pipet. Microplate reader (filter; 450 nm). New 8-OHdG Check KOG-200SE 0.5-200 ng/mL 96 wells Urine and animal serum. [NOTICE]: Our products are for RESEARCH USE ONLY. Not for diagnostic, medical or other use. 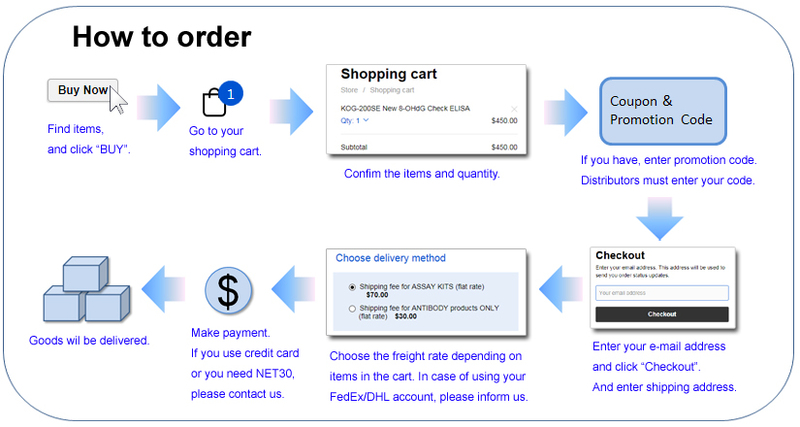 We are making efforts to prevent errors or mistakes on preparing web site documents, instruction manuals and products. But even if some damage would causedby such faults, we will be exempt from responsibility.